At the ‘foot’ of the Peak District, Blore Hall boasts fabulous walking country literally on the doorstep. But if the Great Outdoors should pall for any reason, or if the weather is less than clement – or you just fancy a change – a 30-mile drive due east on the A52 takes you to the home of Robin Hood, in the heart of the Midlands: Nottinghamshire, and a county town replete with history. 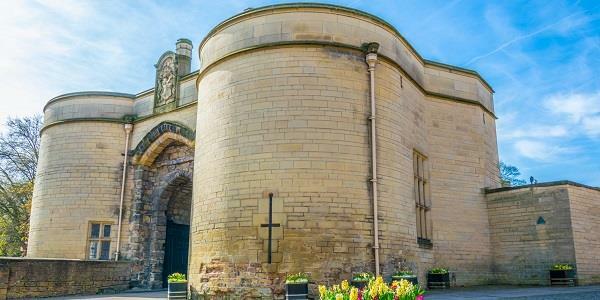 Like most university cities, Nottingham is a vibrant, lively place – bustling by day, and buzzing by night. Sports fans are spoilt for choice: a comparatively small city, with a population of around 280,000, Nottingham is nonetheless home to two football clubs (one of which, Notts County, is the oldest professional football club in the world) and the Nottinghamshire County Cricket Club, whose Trent Bridge base is a regular venue on the Test Match circuit (see earlier blog). As you approach the city on the A52, to the north of you lies the Wollaton Hall estate. Wollaton Hall is an Elizabethan country house of the 1580s, standing on a small but prominent hill in Wollaton Park. 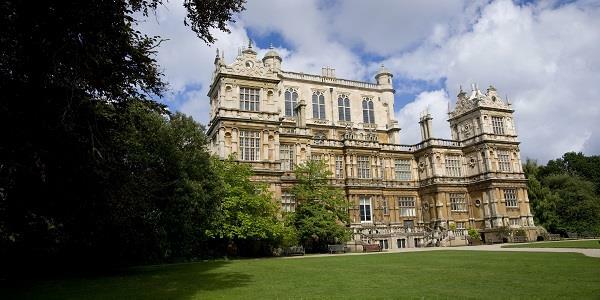 The house, which had a starring role as Wayne Manor in the 2012 Batman movie The Dark Knight Rises, is now Nottingham’s Natural History Museum, with Nottingham Industrial Museum in the out-buildings, both in different ways offering a fascinating glimpse into an ancient and diverse past. 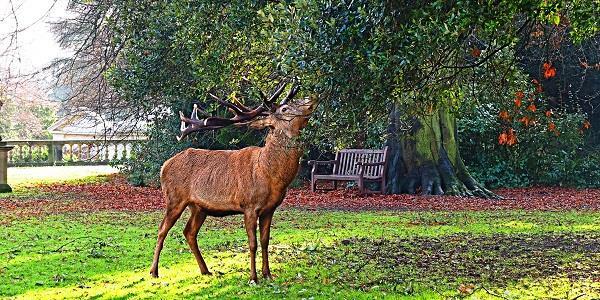 The surrounding 500 acres of parkland (incorporating a picturesque lake) is home to a large herd of free-roaming red and fallow deer. Entry to the Natural History Museum is free. The Industrial Museum costs £3 per adult. Children up to 15 years of age are free, but must be accompanied by an adult. Parking costs £3 for three hours, or £5 for a full day. Dynamic Nottingham may be – but there is (or was) as much going on under the surface as at street level. The city sits atop a hidden network of over 700 caves and tunnels, carved by man out of the soft sandstone on which the place rests. The prime destination to learn about the cave system is the City of Caves in the Broadmarsh Centre, attached to the National Justice Museum. Along with detailing the history of the Broadmarsh and Lace Market area (Nottingham is as famous for lace as Honiton, featured in a previous blog), you can hear about the many purposes of the caves, including their industrial, domestic, and more illicit uses, and you can have a proper explore and discover how the system was first built, and how it evolved through the centuries. Admission to the City of Caves is £7.95 per adult, £6.95 for under-18s, and free for children under five. Other concessions apply. While you’re on a historical jag, stop for lunch at Ye Olde Trip to Jerusalem – the oldest inn in England. The word ‘trip’ here actually means the opposite of a journey – it means a stop along the way. Closer, etymologically, to being tripped up (and thereby forcing a pause). So the pub was a place for pilgrims to rest on their way to the Holy City. 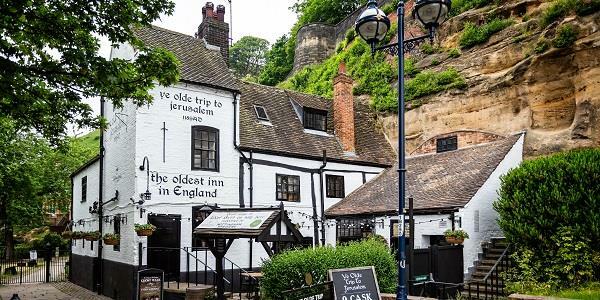 That was then; what it is now is a convivial place to stop for a “pie and a pint” – boasting caves of its own, and built into the rock on which stands the mighty Nottingham Castle. Your final stop. 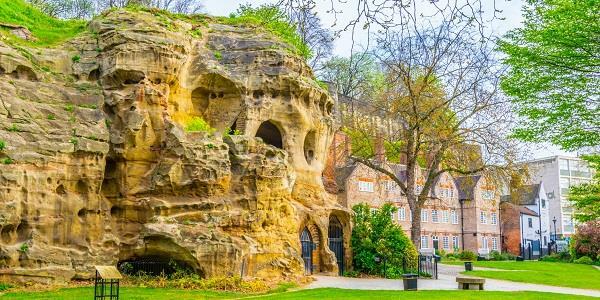 An historic site integral to the legend of Robin Hood, and the starting point for the English Civil War, Nottingham Castle commands spectacular views over the city. As well as its Robin Hood connection, the castle’s history is peppered with all manner of skulduggery: sieges, murders and intrigue abound. Ruination and destruction, too. Much of the original medieval castle fell into disrepair after the Civil War, and the place was largely (though not completely) razed in 1649. However, after the Restoration in 1660, Henry Cavendish, 2nd Duke of Newcastle, built a magnificent Ducal mansion on the site, retaining the gatehouse of the medieval fortress, and much of the walling of the outer bailey. 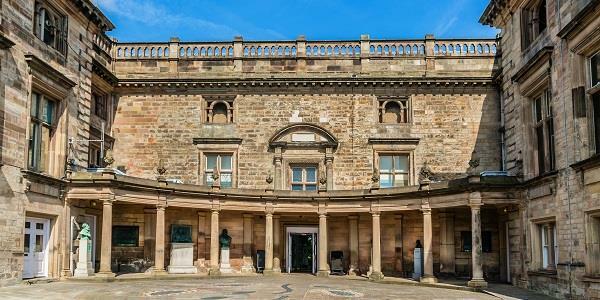 The mansion now houses a splendid museum and art gallery. Sadly, the castle is closed until 2020 to undergo a £30 restoration project; but it’s still well worth a look from the outside, and you can always put a date in the diary for a return trip. Which you can make the next time you’re holidaying at Blore Hall.